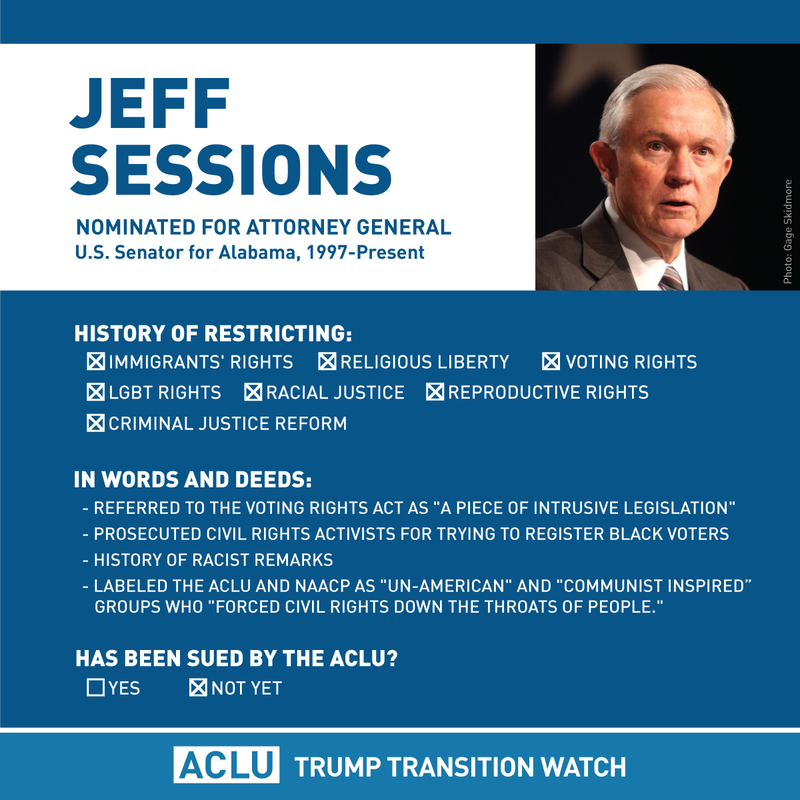 The attorney general implements and enforces our nation’s civil rights, non-discrimination, and disabilities laws. The attorney general will also make decisions about the enforcement of federal criminal law, including investigating and prosecuting national security cases. 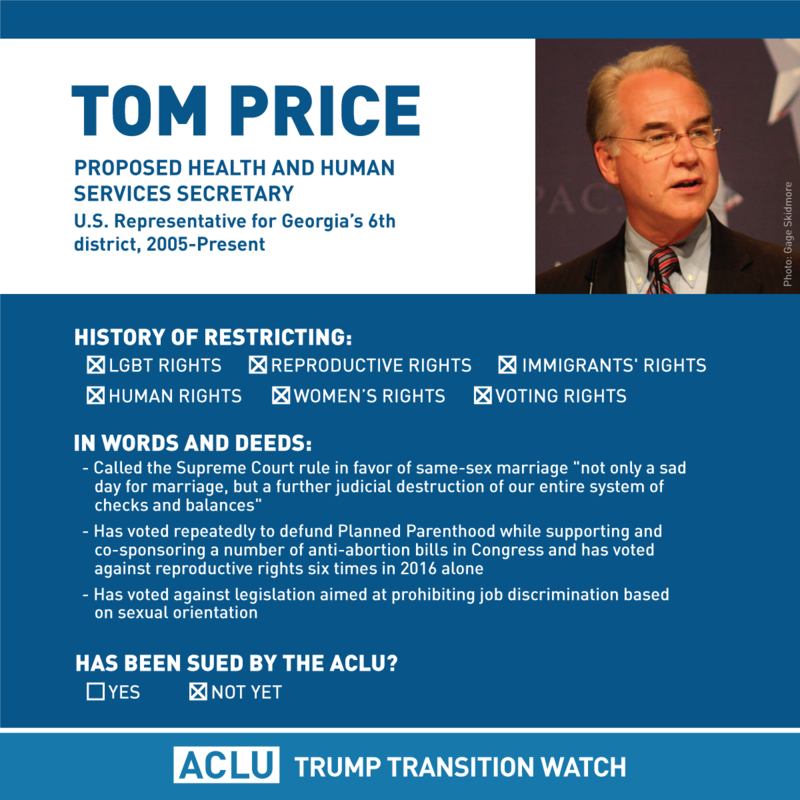 The secretary oversees all operating divisions of the Department of Health and Human Services, which sets and implements policy impacting access to healthcare, including reproductive healthcare and services for people with disabilities. 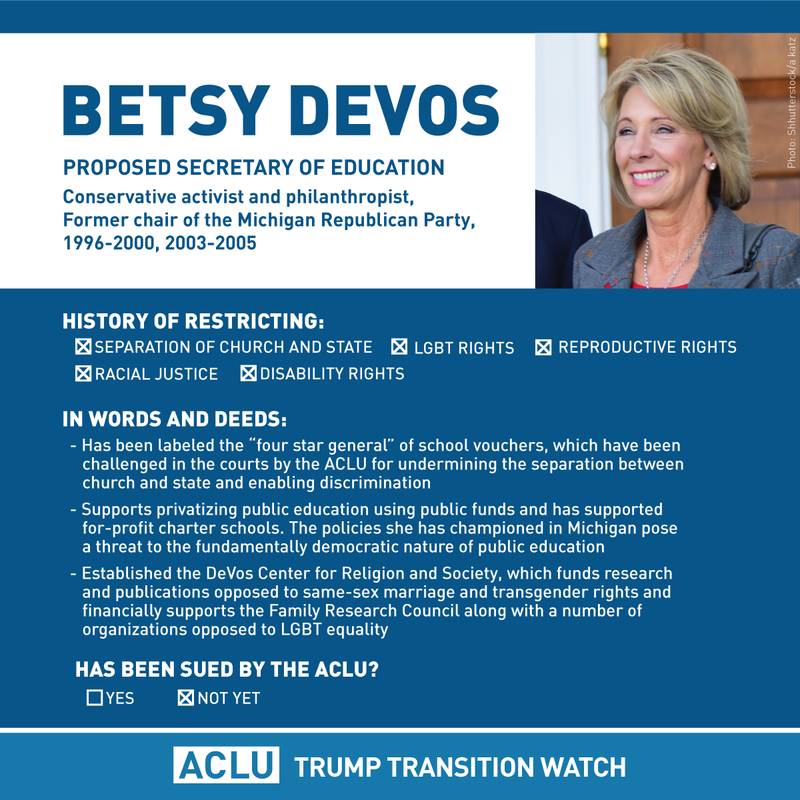 The Secretary of Education is tasked with developing and overseeing most federal assistance to education, and with enforcing educational laws regarding privacy and civil rights. The Secretary has influence over the development of education and civil rights policy and sits at the center of debates over the separation of church and state and affirmative-action. The assistant to the president for National Security Affairs, or national security advisor, is a senior aide in the Executive Office of the President who advises White House staff on national security issues. 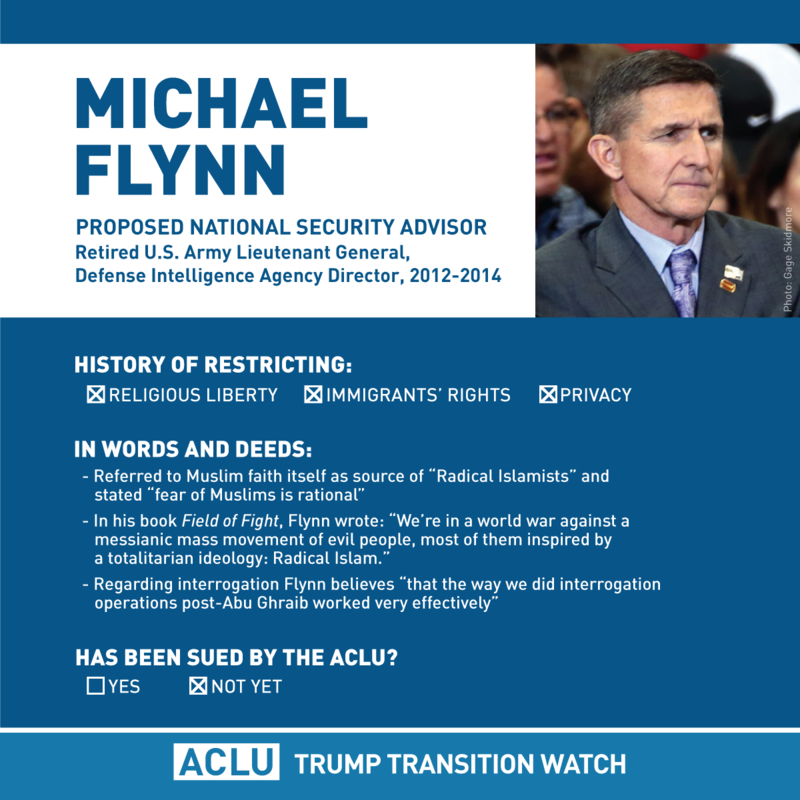 The specific parameters of the national security advisor’s role varies in each administration. The advisor does not have management or fiscal authority over a governmental department but is able to offer advice to the president independently. The secretary of the Department of Homeland Security helps develop and implement U.S. counterterrorism and national security policy. The Department will also play an important role in immigration issues. 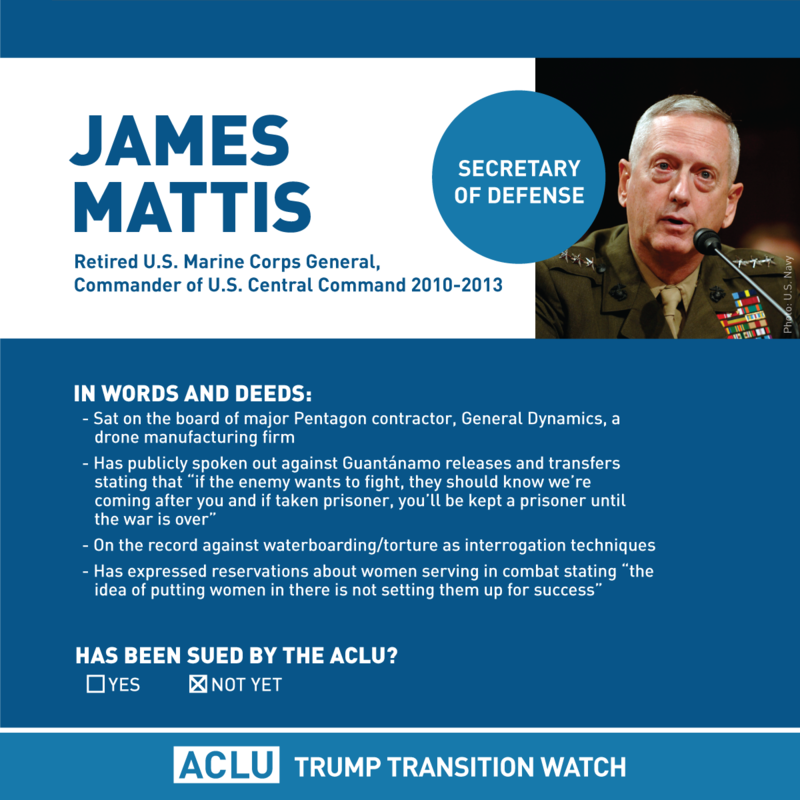 The secretary of the Department of Defense helps develop and implement policy on national security and defense issues, as well as issues involving military personnel. The secretary of Housing and Urban Development enforces our nation’s housing rights laws, including those which protect civil rights and prevent discrimination. The Department of Energy Secretary is charged with advancing the national, economic, and energy security of the United States; promoting scientific and technological innovation in support of that mission; and ensuring the environmental cleanup of the national nuclear weapons complex. The Administrator of the Environmental Protection Agency (EPA) is charged with enforcing the nation’s environmental statutes. During his confirmation hearings, lawmakers and the American public should closely examine Scott Pruitt’s record to ensure that he possesses the respect for the Constitution that the people of this nation expect from the holders of high office. 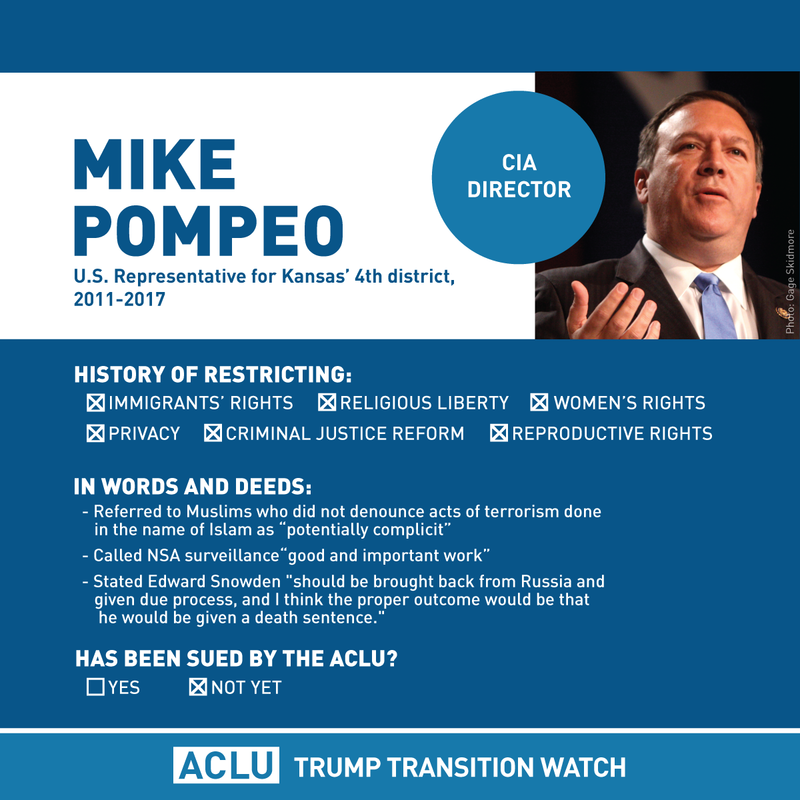 The director of the Central Intelligence Agency plays a critical role in the development and implementation of policy involving national security and defense issues. Deputy Attorney General: The deputy attorney general assists in implementing and enforcing our nation’s civil rights, non-discrimination and disabilities laws. This position also works closely with the Office of the Pardon Attorney to make recommendations to the White House Counsel. Inspector General: The Office of the Inspector General decides when to investigate fraud, abuse, and mismanagement within the Department of Justice and plays a key oversight role within the Executive Branch. Assistant AG, Office of Legal Policy: The assistant attorney general for the Office of Legal Policy coordinates all Department of Justice regulations and the judicial nominations process for the White House. Assistant AG, Office of Legal Counsel: The assistant attorney general for the Office of Legal Counsel provides legal advice that binds the Executive Branch, including on national security issues. Assistant AG, National Security Division: The assistant attorney general of the National Security Division serves as a bridge between law enforcement and the Intelligence Community. This position will play a role in policy development on national security issues. Assistant AG, Civil Rights Division: The assistant attorney general for the Civil Rights Division plays a key role in implementing and enforcing our nation’s federal voting rights, civil rights, non-discrimination, and disabilities laws. Assistant AG, Office of Justice Programs: The assistant attorney general for the Office of Justice Programs provides funding and resources to law enforcement across the United States. Assistant AG, Criminal Division: Assistant attorney general of the Criminal Division works with the U.S. Attorneys to enforce federal criminal laws and helps develop federal criminal justice policy. Assistant AG, Office of Legislative Affairs: Assistant attorney general for the Office of Legislative Affairs works with other Department of Justice agencies and divisions to determine what positions the Department will take on federal legislation. Administrator, Drug Enforcement Agency: The Drug Enforcement Agency administrator enforces our nation’s drug laws and impacts criminal justice issues. Director, Office of National Drug Control Policy: The director of Office of National Drug Control Policy is responsible for aligning the country’s criminal justice policies and public health systems. Director, Community Relations Service: The community relations services director is charged with mediating conflict among community stakeholders on civil rights issues. Director, U.S. Marshals Service: The U.S. Marshals Service has custody of some people who are charged with federal crimes before to they are convicted and is responsible for transporting them to and from court. Director, Office on Violence Against Women: The director of the Office on Violence Against Women provides federal leadership in developing our national capacity to reduce violence against women and administer justice for and strengthen services to victims of domestic violence, dating violence, sexual assault, and stalking. 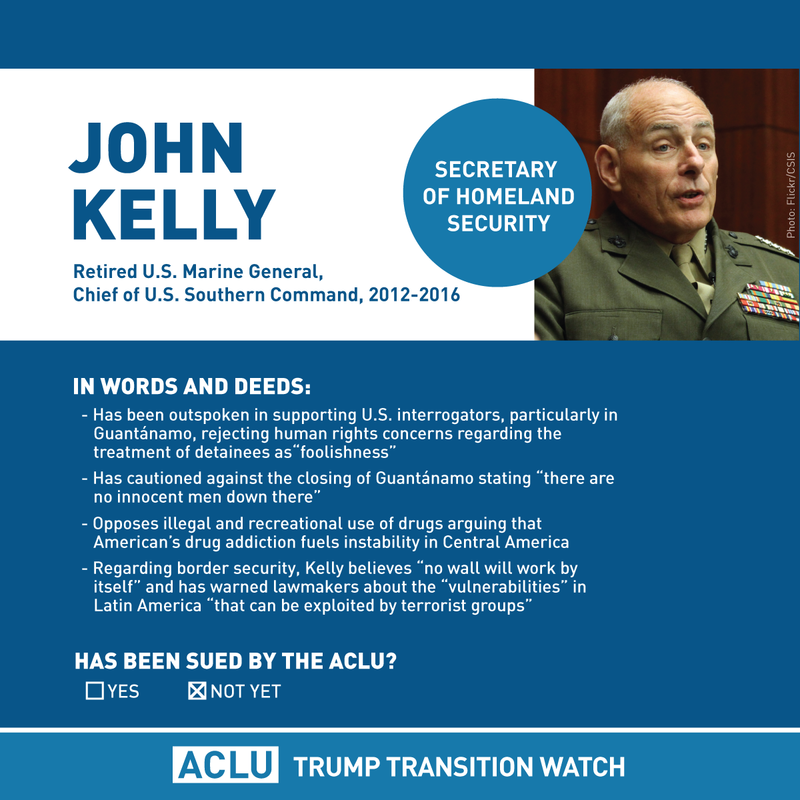 Deputy Secretary: The deputy secretary of the Department of Homeland Security plays an important operational role and could direct immigration and border policy for the Department. General Counsel: The general counsel is responsible for all legal determinations within the Department of Homeland Security and ensures regulatory and statutory compliance. This position will have an impact on policy and its implementation on issues involving national security and immigration. Inspector General: The Office of the Inspector General decides when to investigate fraud, abuse, and mismanagement within Department of Homeland Security, and plays an important oversight function within the Executive Branch. Assistant Secretary/Administrator – Transportation Security Administration: The Transportation Security Administration assistant secretary develops and implements transportation security measures which could impact civil liberties. Assistant Secretary, U.S. Immigration and Customs Enforcement: The Immigration and Customs Enforcement assistant secretary influences how the government will enforce federal laws governing border control, customs, trade, and immigration. Commissioner, U.S. Customs and Border Protection: The commissioner of U.S. Customs and Border Protection is the head of largest law-enforcement agency in the country. Director, U.S. Citizenship and Immigration Services: The director of U.S. Citizenship and Immigration Services controls the administrative processes of our immigration system. The agency impacts how and when immigration applications and services are processed. General Counsel: The general counsel provides legal advice to the Department of Defense on national security issues. Under Secretary, Personnel and Readiness: The under secretary for personnel and readiness plays a role in developing and implementing military personnel policies. Secretary (nominee: Andrew Puzder): The secretary of the Department of Labor is tasked with implementing and enforcing our nation’s labor laws and regulations, including those dealing with non-discrimination and healthcare access. Assistant Secretary, Disability Employment Policy: The assistant secretary of the Office of Disability Employment Policy has influence over improving integration and increasing autonomy of people with disabilities through Department of Labor programs. Administrator, Wage and Hour Division: The administrator is charged with enforcing labor laws and regulations, including those dealing with non-discrimination and healthcare access. Assistant Secretary, Civil Rights: The assistant secretary of civil rights will have influence over civil rights, non-discrimination, and the use of discipline in our nation’s school system. Assistant Secretary, Special Education and Rehabilitative Services: The assistant secretary of special education and rehabilitative services has particular influence over schools’ use of discipline and also influences standards for charter schools, magnet schools, and the use of vouchers in private schools. Secretary (nominee: Rex Tillerson, confirmed on February 1st): The secretary of state represents the United States on foreign policy issues and has a role in all national security issues. Assistant Secretary, Population, Refugees, Migration: The assistant secretary of population, refugees, and migration oversees the refugee resettlement program, including for Syrian and Iraqi refugees. Legal Advisor: The legal advisor advises the State Department on all aspects of foreign policy and has a role in all national security issues. Deputy Secretary and Assistant Secretary for Legislation: The deputy secretary and assistant secretary for Legislation in the Department of Health and Human Services will develop and implement policy impacting access to healthcare, including reproductive healthcare and services for people with disabilities. Inspector General: The inspector general is responsible for oversight of the Department of Health and Human Services, including the Centers for Medicare & Medicaid Services, Administration for Children and Families, Food and Drug Administration, and National Institutes of Health. Assistant Secretary of Aging and Administration for Community Living: The assistant secretary of Aging and Administration for Community Living plays a key role in developing and implementing regulations to protect persons with disabilities. Commissioner, Administration for Children, Youth, Families: The commissioner of the Administration for Children, Youth, and Families influences policy related to Department programs that provide healthcare and other services to children and families. The agency is also responsible for custody and protection of unaccompanied children, including Central American refugees. Administrator , Centers for Medicare and Medicaid Services: The administrator for the Centers for Medicare and Medicaid Services oversees health care programs which serve millions of people with disabilities and low income people and issues guidance on healthcare issues. Commissioner, Food and Drug Administration: The commissioner of the Food and Drug Administration develops and implements policies that impact persons with disabilities. Director, Indian Health Service: The director of Indian Health Services oversees the agency responsible for providing federal health services to American Indians and Alaska Natives. Commissioner, Internal Revenue Service (nominee: Steven Mnuchin, confirmed on February 13th): The commissioner of the Internal Revenue Service has a role in implementing housing protections. Assistant Secretary, Fair Housing and Equal Opportunity: The assistant secretary for Fair Housing and Equal Opportunity impacts policy on affordable housing and civil rights and other non-discrimination protections within the housing market. Director: The director of Office of the Director of National Intelligence plays a kay role in the overall direction of the Intelligence Community. General Counsel: The general counsel of the Office of the Director of National Intelligence impacts U.S. national security policy. Inspector General of the Intelligence Community: The inspector general is responsible for conducting Intelligence Community audits, investigations and reviews, and plays an important role in preventing or addressing abuse. General Counsel: The general counsel for the Central Intelligence Agency helps develop and implement policy involving national security issues. Inspector General: The inspector general is responsible for conducting Central Intelligence Agency audits, investigations and reviews, and plays an important role in preventing or addressing abuse. Director: The director of the National Security Agency plays an important role in developing and implementing U.S. surveillance policies. Inspector General: The inspector general is responsible for conducting audits, investigations and reviews of the National Security Agency, and plays an important role in preventing or addressing abuse. Chair and Members: The Privacy and Civil Liberties Oversight Board conducts reports on the impact of government counterterrorism programs on civil liberties. Commissioners: The commissioners of the Federal Communications Commission help develop and vote on rules on a wide range of issues impacting consumer’s interactions with telecommunications providers. Associate Director, National Security and International Affairs: The National Security and International Affairs division of the Office of Science and Technology Policy works on a range of technology polices involving privacy, security and surveillance. Commissioner: The Election Assistance Commission issues recommendations and guidance to states on administration of elections. Commission comprised of two Republican and two Democratic members; there is currently an opening for a Democratic commissioner. Chair, Vice Chair and Commissioners: The commissioners of the Equal Employment Opportunity Commission are responsible for establishing and implementing policy for the enforcement of civil rights, non-discrimination, and disabilities laws. The Commission holds public meetings, proposes regulations, and issues guidance. General Counsel: The general counsel of the Equal Employment Opportunity Commission oversees and coordinates the Commission’s litigation agenda throughout its 15 regional offices.